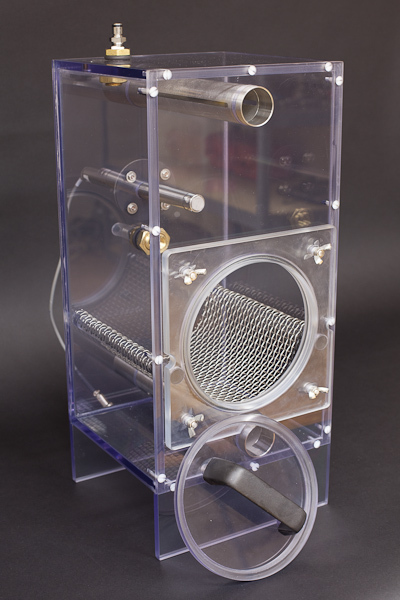 Biaera’s large animal exposure system for infectious agents integrates the AeroMP control platform with a head only exposure chamber. 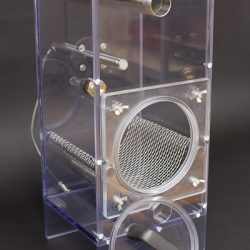 The 16 Liter chamber was originally developed at USAMRIID and has long been used for exposures with a variety of infectious agents under high containment conditions [Williamson (2011); Nalca (2010); Heine, et. al., (2007); Hartings (2004); Johnson (1995)]. Aerosols are generated with a three-jet collision nebulizer. 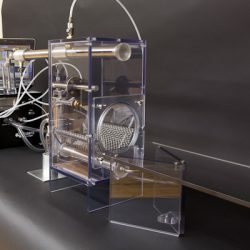 The collision has been the primary aerosol generation device in the infectious aerosol research community [Stephenson (1988); Jeddeloh (2003); Roy (2003); Hartings (2004); Heine (2007); Roy (2009), Nalca (2010), Williamson (2011), Johnson (1995)]. It combines ease-of-use, durability, and reliability in high containment aerosols with a consistent record of producing bioaerosols without adversely affecting the infectivity of biologics in acute exposures. Control, monitoring, and recording of the collision operation are all managed through the AeroMP control platform. Aerosol sampling is accomplished with a 6 LPM all-glass impinger. The all-glass impinger also has an established history in infectious disease research with a variety of agents [Stephenson (1988); Jeddeloh (2003); Roy (2003); Hartings (2004); Heine (2007); Roy (2009), Nalca (2010), Williamson (2011), Johnson (1995)]. The impinger collects a sample of the aerosol during the exposure. Subsequent analysis and enumeration of the sample provides confirmation of aerosol characteristics and provides the basis for calculating the inhaled dose to the subjects. While impingers of various flow rates are available, the 6 LPM impinger is sufficient to achieve a high sampling efficiency while not disrupting the flow dynamics in the head-only chamber. Control, monitoring, and recording of the impinger functions are all achieved through the AeroMP control platform. 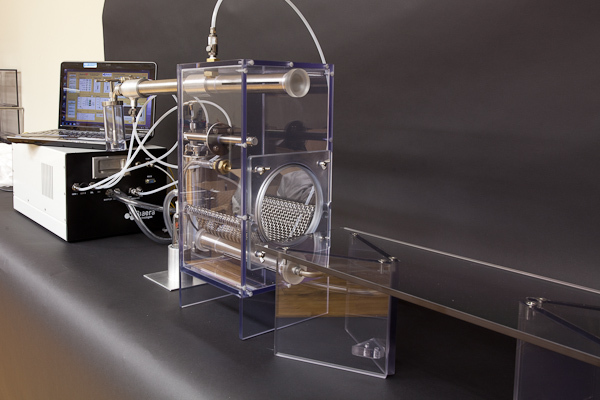 The chamber operates in a “push-pull” modality, meaning that aerosol is constantly being supplied to and exhausted from the chamber. This dynamic exposure method ensures that the infectivity of the infectious agent is not compromised by an extended residence time in the chamber. 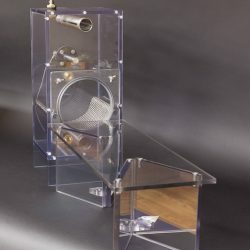 This chamber operates at a recommended flow rate of 16 LPM resulting in an aerosol residence time in the chamber of one minute. All of the flow rates to and from the chamber are managed by the AeroMP control platform. A latex dental dam stretched across a chamber opening provides access for the subject. An appropriately sized hole in the dam forms a seal around the subject creating a closed exposure chamber. The chamber is outfitted with probes to monitor the chamber pressure, relative humidity, and temperature through the AeroMP control system. 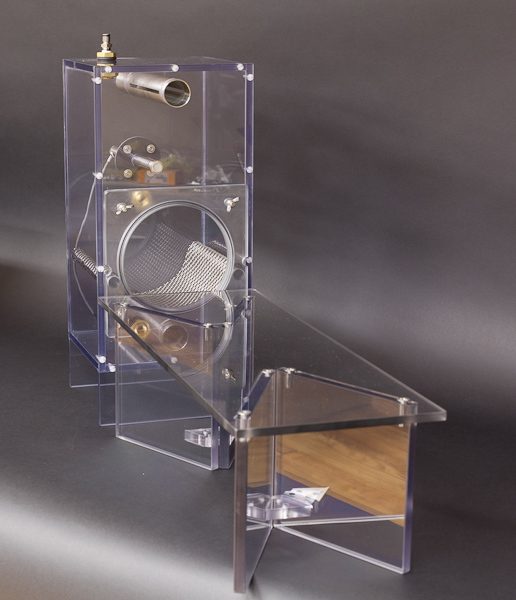 The AeroMP uses the pressure measurement to ensure that the ambient pressure condition in the chamber does not increase or decrease and pose a hazard. The humidity measurement combines with the AeroMP humidification system to maintain a stable, user-defined relative humidity. Deviations in relative humidity can adversely affect the infectivity of agents in aerosols. This control feedback ensures consistency within and across studies for a given agent. The temperature measurement combines with a user-defined temperature range in the AeroMP software to provide assurance that the animals are not experiencing unsuitable conditions during the exposure process. DE Williamson, AJ Simpson, EL Waters, PJ Packer, MLM Pitt, JM Hartings, D Dyer, and N Twenhafel, “Recombinant (Fl +V) vaccine protects cynomologus macaques against pneumonic plague,” Vaccine, 29: 4771 (2011). JM Hartings and CJ Roy “The automated bioaerosol exposure system: platform development and a dosimetry application with nonhuman primates,” Journal of Pharmacological and Toxicological Methods 49, 39 (2004). HS Heine, J Bassett, L Miller, JM Hartings, BE Ivins, MLM Pitt, D Fritz, SL Norris, and RW Byrne, “Determination of antibiotic efficacy against Bacillus anthracis in a mouse aerosol challenge model,” Antimicrobial Agents and Chemotherapy, 51, 1373 (2007). JA Jeddeloh, DL Fritz, DM Waag, JM Hartings, and GP Andrews, “A bio-defense driven murine model of pneumonic melioidosis,” Infection and Immunity 71, 584 (2003). E Johnson, N Jaax, J White, and P Jahrling, “Lethal experimental infectious of rhesus monkeys by aerosolized Ebola virus,” International Journal of Experimental Pathology, 76(4):227 (1995). A Nalca, VA Livingston, NL Garza, EE Zumbrun, OM Frick, JL Chapman, and J.M. Hartings, “Experimental infection of Cynomologus Macaques (Macaca fascicularis) with aerosolized Monkeypox Virus,” PLoS One, 5, el2880 (2010). Roy, C. J., Hale, M., Hartings, J. M., Pitt, M. L., and Duniho, S. “Impact of inhalation exposure modality and particle size on the respiratory deposition ofricin in BALB/c mice,” Inhalation Toxicology 15,619 (2003). CJ Roy, DS Reed, CW Wilhelmsen, JM Hartings, S Norris, and KS Steele, “Pathogenesis of aerosolized Eastern Equine Encephalitis infection in guinea pigs,” Virology Journal, 6, 170 (2009). EH Stephenson, RB Moeller, CG York, and HW Young, “Nose-only versus whole-body aerosol exposure for indication of upper respiratory infectious of laboratory mice,” American Industrial Hygiene Journal, 49, 128 (1988). Talk to us about how our products can serve as the cornerstone of your aerosol program.